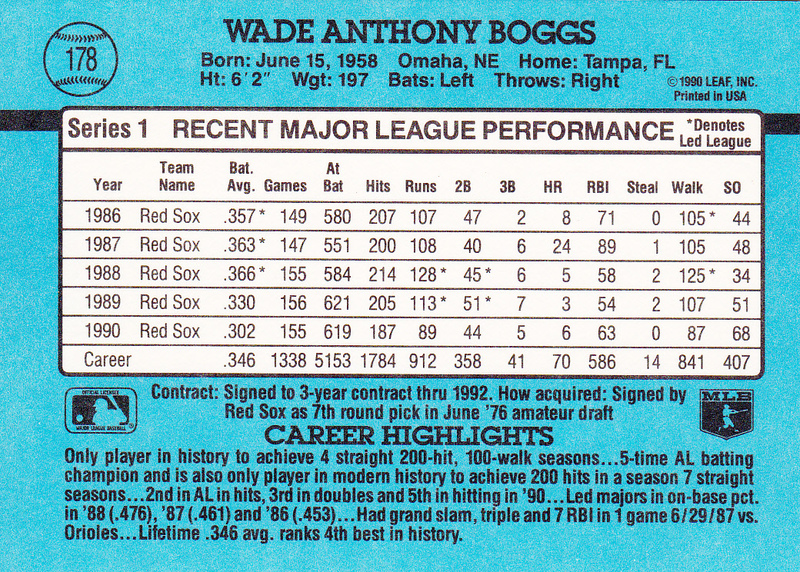 Wade Anthony Boggs (born June 15, 1958) is an American former professional baseball third baseman. He spent his 18-year baseball career primarily with the Boston Red Sox, but also played for the New York Yankees and Tampa Bay Devil Rays. His hitting in the 1980s and 1990s made him a perennial contender for American League batting titles, in much the same way as his National League contemporary Tony Gwynn. Boggs was elected to the Red Sox Hall of Fame in 2004 and the Baseball Hall of Fame in 2005. With 12 straight All-Star appearances, Boggs is third only to Brooks Robinson and George Brett in number of consecutive appearances as a third baseman. 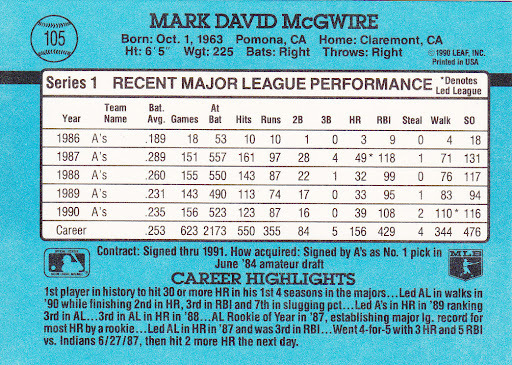 His finest season was 1987, when he set career highs in home runs (24), RBI (89), and slugging percentage (.588). 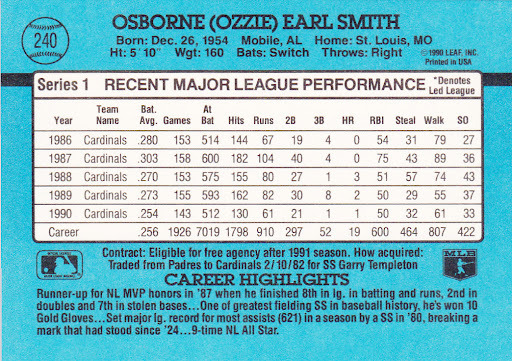 He also batted .363 and had a .461 on-base percentage that year, leading the league in both statistics. In 1999, he ranked number 95 on the Sporting News list of the 100 Greatest Baseball Players, and was a nominee for the Major League Baseball All-Century Team. 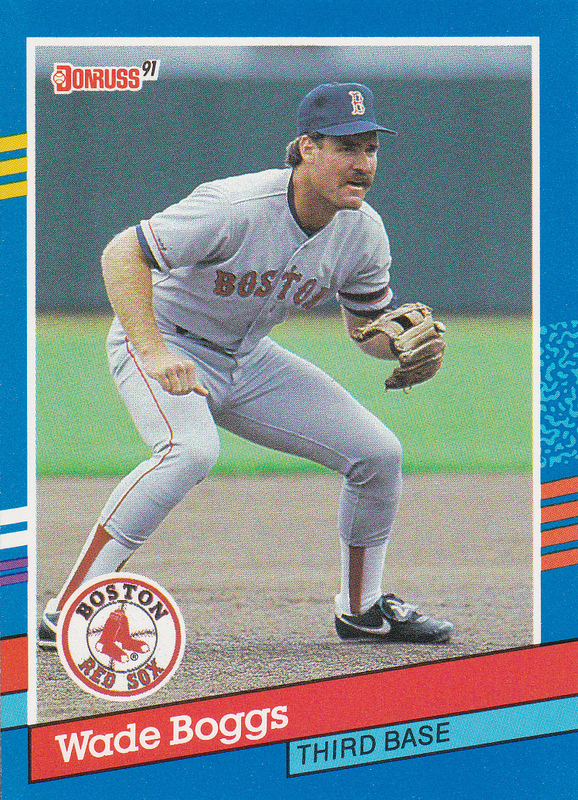 Posted in 1991, 1991 Donruss, Boston Red Sox, Red Sox, Third Base. Bookmark the permalink. Anthony Keith “Tony” Gwynn, Sr. (born May 9, 1960), nicknamed Mr. Padre and Captain Video, is a former Major League Baseball right fielder. He is statistically one of the best and most consistent hitters in baseball history. He played his entire 20-year baseball career for the San Diego Padres (1982–2001). He was elected to the Baseball Hall of Fame on January 9, 2007 and was inducted on July 29. He is the first National League player born during the 1960s to earn the honor (Kirby Puckett was the first American Leaguer). He batted and threw left-handed. 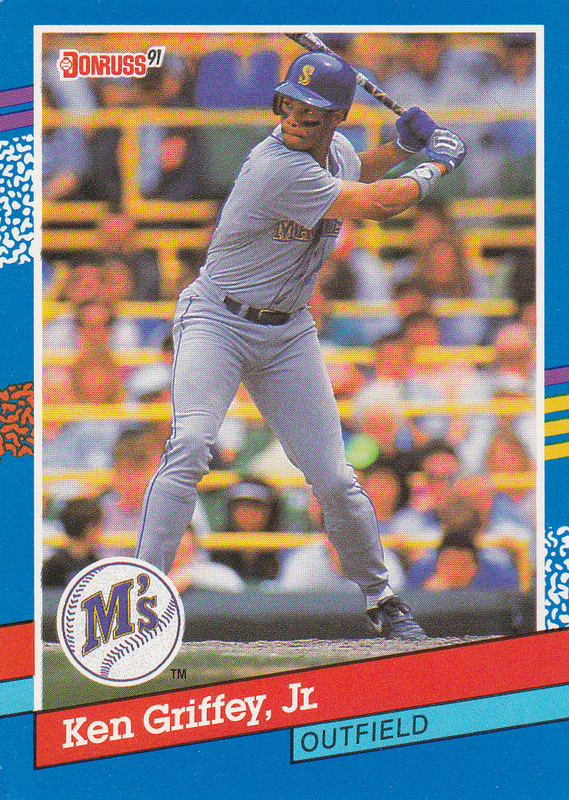 Despite playing much of his career at a “power position” (right field is known for producing sluggers) during a time when home runs were at an all-time high, he was not a home run threat, never hitting more than 17 in any one season during his major league career. Instead, Gwynn made a name for himself by being one of the most consistent contact hitters in the game’s history. 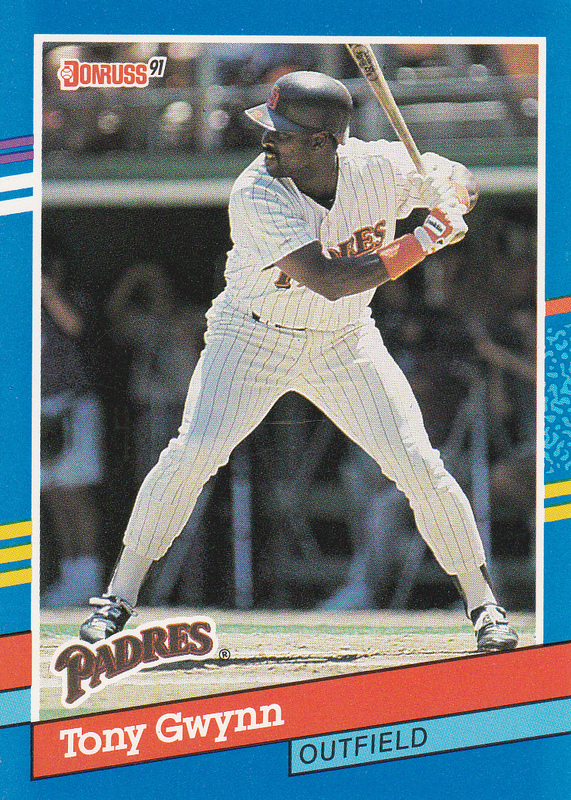 Gwynn hit .338 for his career and won eight National League batting titles. He struck out only 434 times in 9,288 career at-bats, and never batted below .309 in any full season. Gwynn was selected by the Padres in the third round of the 1981 Major League Baseball Draft (the 58th player chosen overall). His uniform number was #19, which the Padres retired in 2004. 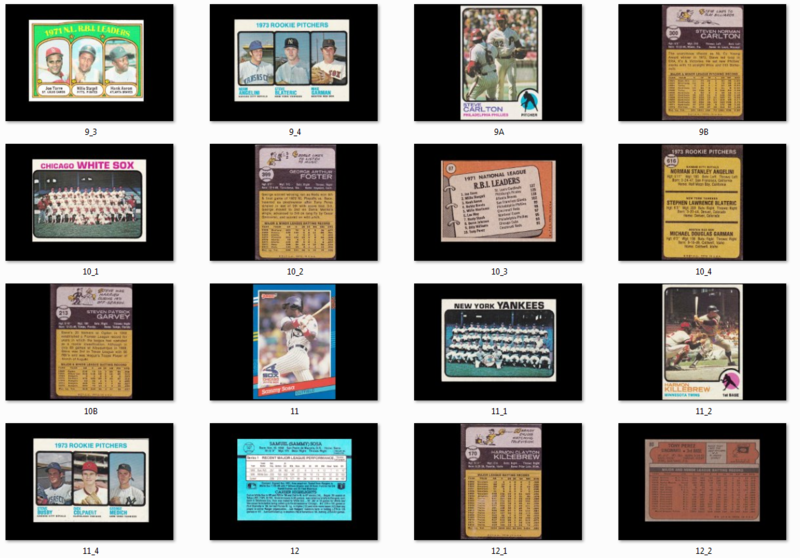 Posted in 1991, 1991 Donruss, Outfield, Padres, San Diego Padres. Bookmark the permalink. 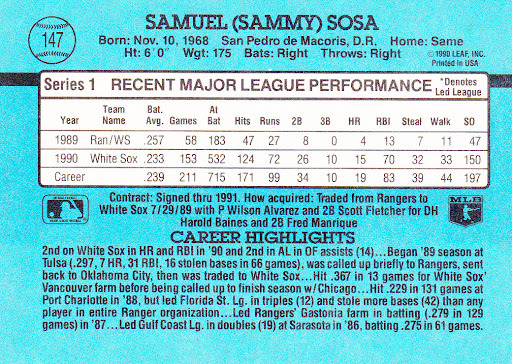 Samuel Peralta “Sammy” Sosa (born November 12, 1968) is a former Dominican Republic Major League Baseball right fielder. Sosa’s Major League career began with the Texas Rangers in 1989. 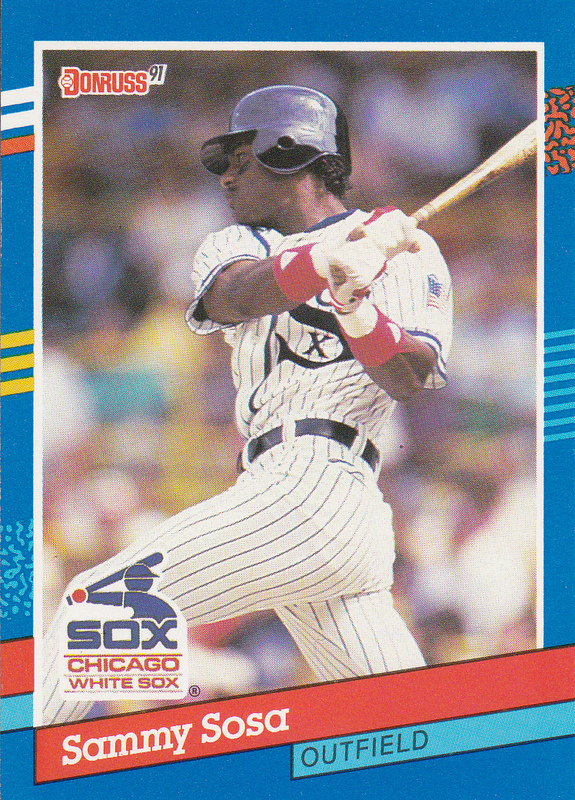 After a stint with the Chicago White Sox, Sosa became a member of the Chicago Cubs in 1992 and subsequently became one of the league’s best hitters. In 1998, Sosa and Mark McGwire achieved national fame for their home run-hitting prowess in pursuit of Roger Maris’ home run record. Although a fan favorite, Sosa fell out of favor in Chicago after he was caught using a corked bat in a 2003 game and later left the team during the final game of the 2004 season. Sosa finished his career with brief stints with the Baltimore Orioles and the Texas Rangers. With the Rangers, Sosa hit his 600th career home run to become the fifth player in MLB history to reach the milestone. He is also the all-time home run leader among foreign-born MLB players. Furthermore, Sosa is one of only two National League Players to ever reach 160 RBI, a milestone he reached in 2001. The other was Cubs player and RBI Champion Hack Wilson during his record setting 1930 season in which he hit 191 RBI. Sosa is the only player to have hit 60 or more home runs in a single season three times. Sosa has long been the subject of speculation about suspected anabolic steroid use during his playing career. On June 16, 2009, The New York Times reported that Sosa had failed a test for performance enhancing drugs in 2003. Posted in 1991, 1991 Donruss, Chicago White Sox, Outfield, White Sox. Bookmark the permalink. My hard drive crashed that I’ve saved all my cards on. I managed to recover almost everything except video’s and wordpad information. Recuva is a hell of a free program. I’m lucky it recovered most of my work from the hard drive. The only drawback was that it renamed everything in numbers instead of names. I now have to go through every recovered image, rename it and put it into a new folder. I also will use my blog and youtube to help put everything back in order. Just a small setback, no big deal. At least I don’t have to start completely over and my collection is still physically intact. Posted in Crash and Burn. Bookmark the permalink. William Roger Clemens (born August 4, 1962), nicknamed “Rocket”, is a former Major League Baseball pitcher who broke into the league with the Boston Red Sox, whose pitching staff he would help anchor for 12 years. Clemens won seven Cy Young Awards, more than any other pitcher. He played for four different teams over his 23-year playing career. In each of his two seasons with the Toronto Blue Jays, Clemens won the pitching triple crown (leading the league in wins, ERA, and strikeouts) and a Cy Young Award. Clemens was traded to the New York Yankees for the 1999 season, where he had his first World Series success. In 2003, he reached his 300th win and 4,000th strikeout in the same game. Clemens is one of only four pitchers to have more than 4,000 strikeouts in their career (the others are pitchers Nolan Ryan, Randy Johnson, and Steve Carlton). Clemens played three seasons with the Houston Astros, where he won his seventh Cy Young Award. He rejoined the New York Yankees during the 2007 season. Clemens was alleged by the Mitchell Report to have used anabolic steroids during his late career, mainly because of testimony given by his former trainer, Brian McNamee. Clemens firmly denied these allegations under oath before Congress, leading congressional leaders to refer his case to the Justice Department on suspicions of perjury. On May 12, 2009, he broke a long silence to speak out on ESPN against American Icon: The Fall of Roger Clemens and the Rise of Steroids in America’s Pastime, a book by four New York Daily News reporters that claims Clemens used performance-enhancing drugs during his career. On August 19, 2010, a federal grand jury at the U.S. District Court in Washington, D.C., indicted Clemens on six felony counts involving perjury, false statements and obstruction of Congress. On August 30 he pleaded not guilty, and a trial date was set for April 5, 2011. On December 9, it was announced that the trial would be pushed back until July 2011. The trial began on July 13, 2011 but a mistrial was declared on the second day of testimony due to prosecutorial misconduct. 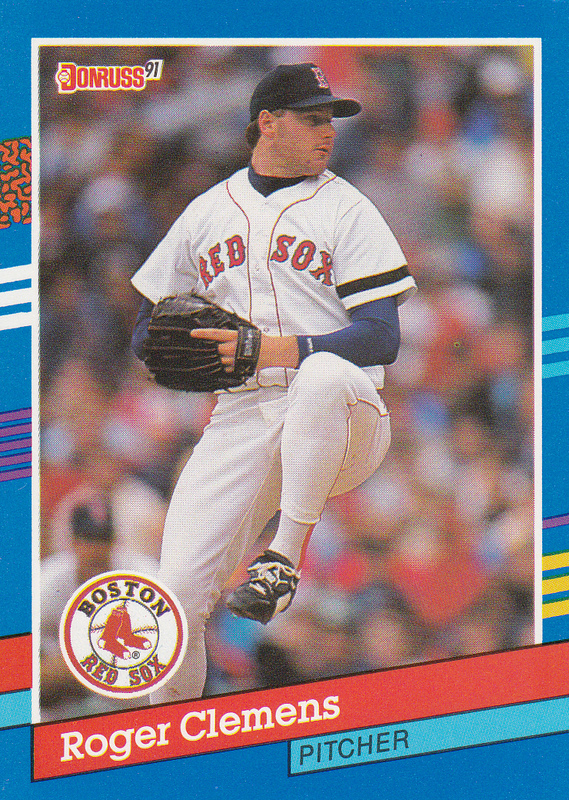 Posted in 1991, 1991 Donruss, Boston Red Sox, Pitcher, Red Sox. Bookmark the permalink. 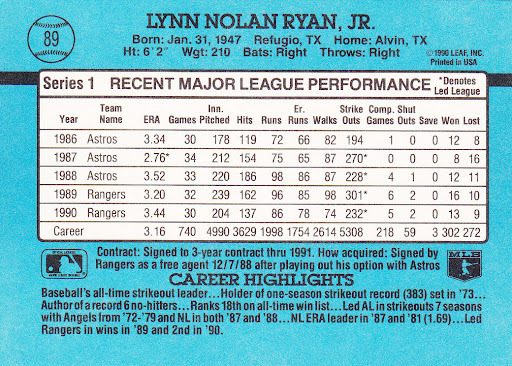 Lynn Nolan Ryan, Jr. (born on January 31, 1947), nicknamed “The Ryan Express”, is a former Major League Baseball pitcher. He is currently the owner, CEO, and team president of the Texas Rangers. During a major league record 27-year baseball career, he pitched in 1966 and from 1968–1993 for four different teams: the New York Mets, California Angels, Houston Astros, and Texas Rangers. He was inducted into the Baseball Hall of Fame in 1999. Ryan is the all-time leader in no-hitters with seven, three more than any other pitcher. He is tied with Bob Feller for most one-hitters, with 12. Ryan also pitched 18 two-hitters. Despite the seven no-hitters, he never threw a perfect game, nor did he ever win a Cy Young Award. Ryan is one of only 29 players in baseball history to date to have appeared in Major League baseball games in four decades. 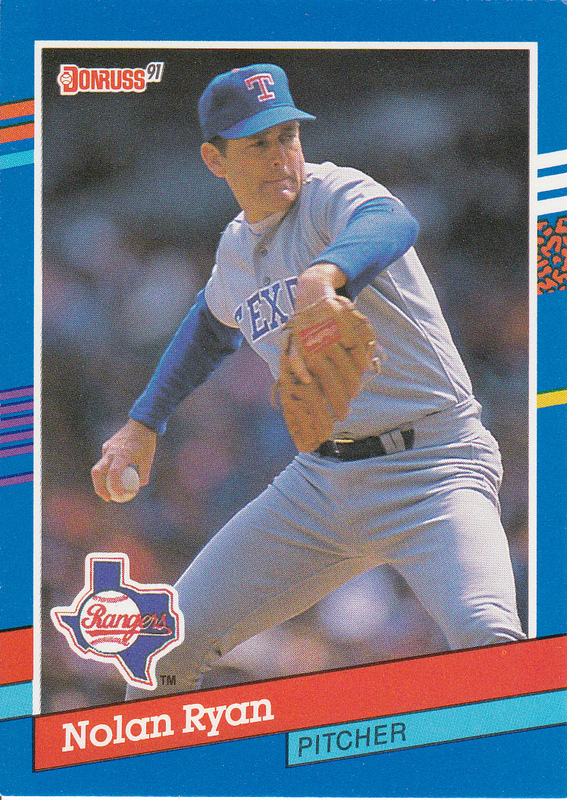 Posted in 1991, 1991 Donruss, Pitcher, Rangers, Texas Rangers. Bookmark the permalink. Mark McGwire (born October 1, 1963), nicknamed “Big Mac”, is an American former professional baseball player who played his major league career with the Oakland Athletics and the St. Louis Cardinals. He is currently the hitting coach for the St. Louis Cardinals. For his career, McGwire averaged a home run once every 10.61 at bats, the lowest at bats per home run ratio in baseball history (Babe Ruth is second at 11.80). In 1987, he broke the single-season home run record for rookies, with 49. In 1998, McGwire and Sammy Sosa achieved national fame for their home run-hitting prowess in pursuit of Roger Maris’ single season home run record; McGwire broke the record and hit 70 home runs that year. Barry Bonds now holds the record, after hitting 73 home runs during the 2001 season. In 2005, McGwire and Canseco were among 11 baseball players and executives subpoenaed to testify at a congressional hearing on steroids. During his testimony on March 17, 2005, McGwire declined to answer questions under oath when he appeared before the House Government Reform Committee. On January 11, 2010, McGwire admitted to using steroids on and off for a decade and said, “I wish I had never touched steroids. It was foolish and it was a mistake. I truly apologize. Looking back, I wish I had never played during the steroid era.” He admitted using them in the 1989/90 offseason and then after he was injured in 1993. He admitted using them on occasion throughout the ’90s, including during the 1998 season. McGwire stated that he used steroids to recover from injuries. McGwire’s decision to admit using steroids was prompted by his decision to become hitting coach of the St. Louis Cardinals. According to McGwire, he took steroids for health reasons rather than to improve performance. 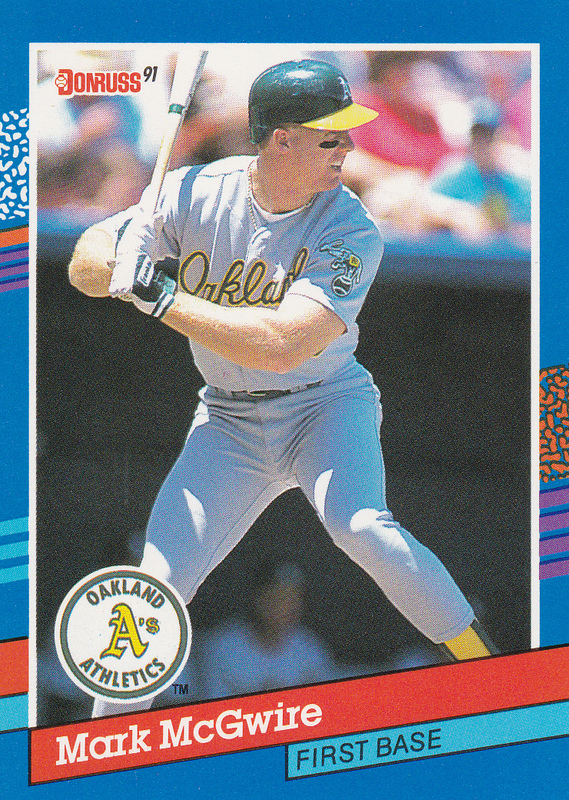 Posted in 1991, 1991 Donruss, A's, First Base, Oakland A's. Bookmark the permalink. 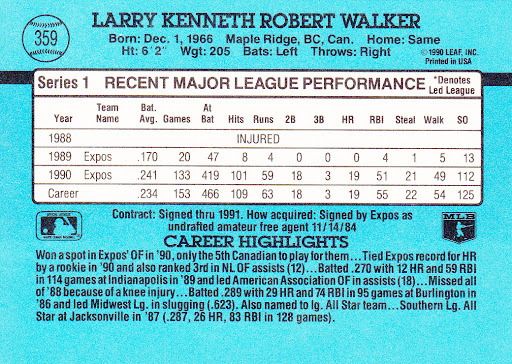 Larry Kenneth Robert Walker (born December 1, 1966) is a former right fielder in Major League Baseball. From 1989 through 2005, Walker played for the Montreal Expos (1989–1994), Colorado Rockies (1995–2004), and St. Louis Cardinals (2004–2005). He announced his retirement after Game 6 of the 2005 National League Championship Series. Walker’s career season came in 1997, when he hit .367 with 49 home runs, 130 RBI, 33 stolen bases, and 409 total bases, en route to becoming the first Canadian player to win the MVP Award. He became and remains the only player to have at least 25 stolen bases and a slugging percentage of more than .700 in a season. Walker’s 409 total bases in 1997 were the most in an NL season since Stan Musial’s 1948 season, although the mark was bettered by Barry Bonds in 2001. 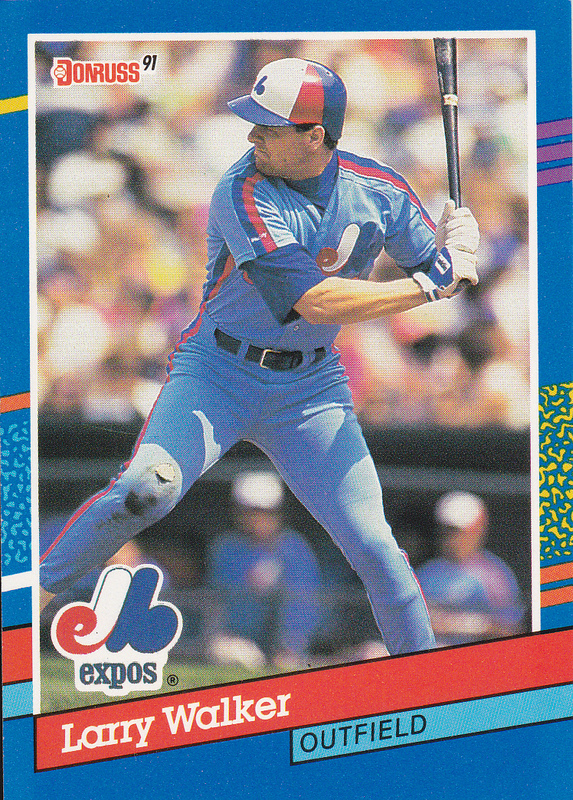 Posted in 1991, 1991 Donruss, Expos, Montreal Expos, Outfield. Bookmark the permalink. George Kenneth “Ken” Griffey, Jr. (born November 21, 1969), nicknamed “Junior” and “The Kid”, is a former Major League Baseball outfielder, occasional firstbaseman, and during his final years, designated hitter. Griffey was both one of the most prolific home run hitters and best defensive players in baseball history, fifth on the list of most career home runs, and is tied for the record of most consecutive games with a home run (8 games, tied with Don Mattingly and Dale Long). Griffey, playing for the Seattle Mariners in two separate tenures, Cincinnati Reds and the Chicago White Sox, won 10 Gold Glove awards and appeared in 13 All-Star games. Upon his retirement, the Associated Press noted: “In his prime, Ken Griffey Jr. was unanimously considered the best player in baseball.” Throughout his major league baseball career, Griffey was a popular player and a fan favorite around the league. Griffey attained widespread recognition by signing lucrative deals with companies of international prominence like Nike and Nintendo (owners of the Mariners); his popularity reflected well upon MLB and is credited by some with helping restore its image after the 1994 labor dispute. He currently works in the Mariners’ front office as a special consultant. Griffey is one of only 29 players in baseball history to date to have appeared in Major League games in four different calendar decades. 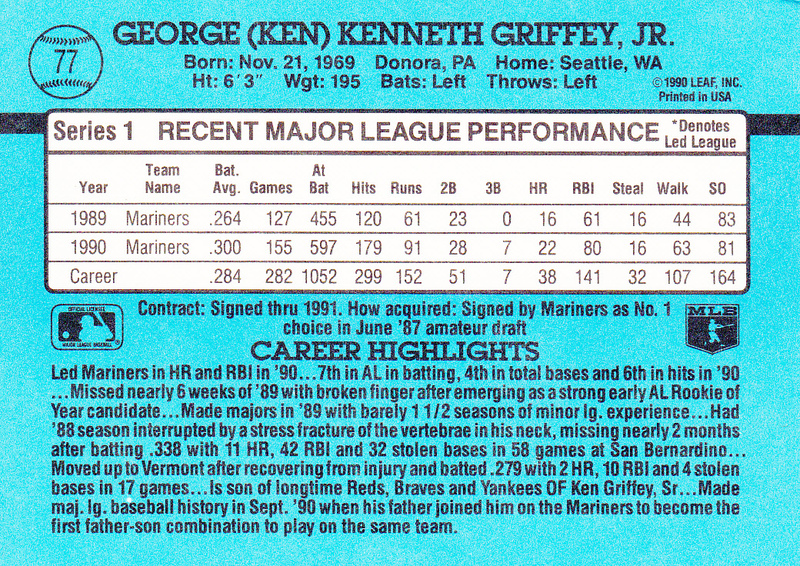 Posted in 1973 Rookie Outfielder, 1991, 1991 Donruss, Mariners, Seattle Mariners. Bookmark the permalink.